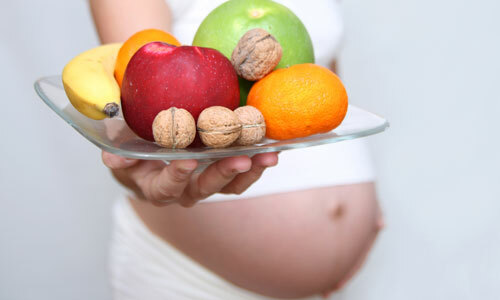 Pregnancy Nutrition – What to eat? Eating healthfully during pregnancy is one of the best things you can do. The food you eat is your baby’s only source of nutrition. Smart choices about nutrition can help you promote your baby’s growth and development. Grains provide essential carbohydrates, your body’s main source of energy. Many whole-grain and enriched products also contain fiber, iron, B vitamins, various minerals and protein. Fortified cereals can help you get enough folic acid. How much: Choose six to nine servings a day. If that sounds like a lot, relax. It may not be as much as you think. Fruits and vegetables provide various vitamins and minerals, as well as fiber to aid digestion. Vitamin C, found in many fruits and vegetables, helps you absorb iron. It also promotes healthy gums and other tissues for both you and your baby. Dark green vegetables have vitamin A, iron and folate — other important nutrients during pregnancy. How much: Choose three or more servings of fruit and four or more servings of veggies a day. It’s easy! Top your cereal with slices of fresh fruit. Make a veggie pizza. Sneak extra vegetables into your casserole. Foods in this group have plenty of protein, as well as B vitamins and iron. Protein is crucial for your baby’s growth, especially during the second and third trimesters. How much: Choose two or more servings of protein-rich foods a day. Eat peanut butter toast for breakfast. Make scrambled eggs or an omelet for lunch. Serve a salmon fillet for dinner. Add chickpeas or black beans to your salad. Snack on a handful of soy nuts. The calcium in dairy products and calcium-fortified soy milk helps build your baby’s bones and teeth. Dairy products also have vitamin A, vitamin D and protein. How much: Choose four or more servings a day. Drink the milk in your cereal bowl. Eat yogurt for your afternoon snack. Have a glass of milk with dinner. Add cheese to a salad. There are no minimum requirements for fats and sweets. It’s OK to indulge once in a while, as long as you’re getting the nutrients you need and your weight gain is on target. To avoid going overboard, keep an eye on portion size. Even women who eat healthfully every day may miss out on key nutrients. A daily prenatal vitamin — ideally starting three months before conception — can help fill any gaps. Your health care provider may recommend special supplements if you follow a strict vegetarian diet or have any chronic health conditions.